Today’s guest blogger is Cassie Ely, Manager in the Office of Chief Scientist for the Environmental Defense Fund. Read how the organization uses Google Maps APIs to help combat climate change by locating methane leaks underneath city streets. The Environmental Defense Fund (EDF) works to solve the world’s biggest environmental problems through innovative public policies, robust science and cross-cutting partnerships with leading voices in the business community. Our partnership with Google reflects all three approaches. Most people don’t realize that a major contributor to global warming is methane, the primary component of natural gas. It’s an extremely powerful greenhouse gas: 84 times as impactful as carbon dioxide over a 20-year timeframe. We still need to reduce carbon dioxide emissions, but cutting the amount of methane emitted into the atmosphere has the power to reduce the rate of global warming when time is of the essence. About 25 percent of the warming we face right now is due to methane. It can be released from biological sources like landfills and cow pastures, but can also come from leaky pipes underneath city streets, delivering the natural gas that heats our homes and provides cooking fuel. We thought that if we could reduce those gas leaks, we could help slow climate change. To address this issue, we joined forces with Google Earth Outreach to put methane analyzers on Google Street View cars. While the cars drive to capture 360-degree Street View imagery, the analyzers measure the concentration of the methane gas in the air. The team is also working with a scientist and professor at Colorado State University, Joe von Fischer, to analyze the spikes in methane levels and detect leaks in the underground pipes. We do multiple drive-passes and combine the readings with methane plume lengths and environmental factors to identify the severity of the leaks. We’ve conducted this research in 10 cities, where we’ve mapped over 4,000 methane leaks. 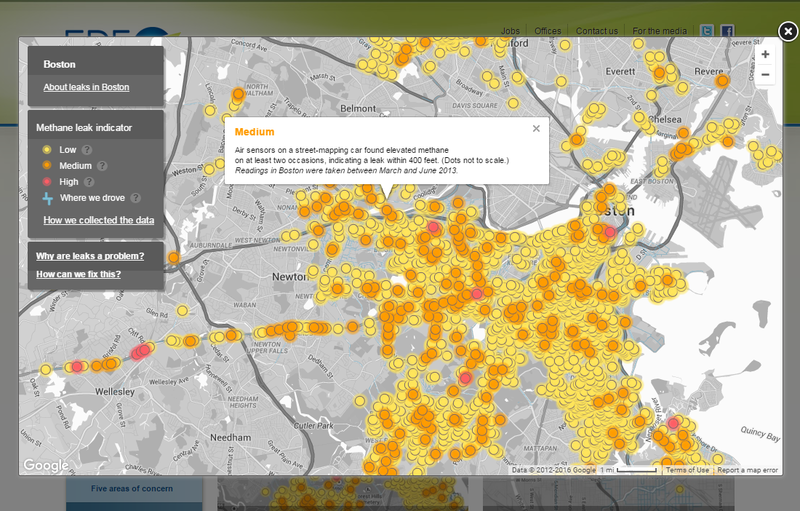 Anyone can visit edf.org/methanemaps to view leak maps of several U.S. cities, such as Boston, MA. With layered mapping, we've shown that there's an average of one leak per mile (in Boston) to one leak every 200 miles (in Indianapolis), demonstrating the effectiveness of techniques like using plastic piping instead of steel for pipeline construction. We hope utilities can use this data to prioritize the replacement of gas mains and service lines (like New Jersey’s PSE&G announced last fall). Global warming is a huge global threat to all of our ecosystems, our livelihood and our health. It affects everything we do. By making information about methane leaks transparent, we’re providing a unique way for utilities, regulators and the public to work together and invest in infrastructure improvement and repairs — helping us reach our ultimate goal of combatting climate change. If you are a nonprofit and interested in staying up to date on grants offerings for Google products like Google Maps APIs, apply to join Google for Nonprofits today.